6 winners since Monday. If Carlsberg did weeks …. 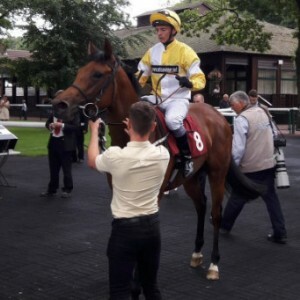 Ontoawinner had a truly memorable week notching up 6 winners throughout the week, culminating in a superb Saturday that saw Flying Pursuit win the Sky Bet Dash Class 2 handicap at York and Raydiance win the Pat Eddery Listed stakes at Ascot. Monday got the week off to a flyer when Cosy Club led from pillar to post to record his first victory in Yellow and White under a superb ride from young Danny Sheehy, you will be hearing a lot more about the young Kilkenny native in the months and the years to come, a natural in the saddle. A big well done to Adrian Keatley on his first victory for us, hopefully the first of many. Tuesday saw London Protocol travel to France for a conditions race. The Muhtathir gelding travelled to Compiegne to run in the Prix De Vignemont with Tony Poccone aboard the Karl Burke trained runner. Tony kept him prominent throughout and pushed him into the lead coming into the home straight and he went onto score, landing over 14000 euro prize money for his owners in the process. Tres Bien. On Thursday, Seduce Me won the fillies handicap at Newbury where Jim Crowley picked up a spare ride aboard the Karl Burke trained runner as Oisin Murphy got delayed in traffic on the way to the course. Seduce Me loves a bit of cut and hadn’t had her optimum conditions recently. She travelled supremely throughout and went on to score with ease on the day, a fantastic win for all her owners. On Friday evening, Double Reflection travelled to Chepstow to run in fillies novice auction stakes over 6 furlongs. She was named Double Reflection due to her striking resemblance to our star filly Quiet Reflection. She showed the same love for a bit of cut when landing the prize under an excellent ride from Clifford Lee. This filly now looks very well bought at a price of £7000 by Ontoawinner. She now looks to be one of the bargains of the year. Super Saturday saw Flying Pursuit win under a superb ride from Rachael Richardson. She bounced the Tim Easterby trained son of Pastoral Pursuits from the gates and led from pillar to post for as convincing a victory that you would see in a ultra-competitive handicap. He won prize money of over £31 k for the race yesterday, a cracking horse for his owners. A huge well done to Rachael and to Tim, whose horses are in such good form. Our final win of the week came at Ascot where Jim Crowley was once again jockey aboard the Karl Burke trained Raydiance. Raydiance, a £7500 purchase by Ontoawinner was having his third racecourse start having won 1 and placed second in his 2 previous outings. He had won of soft previously and as the rain arrived at Ascot, he tightened into 7/1 from 12’s. He travelled very well throughout and showed a superb attitude in the final strides to get back up to win, black type! A big well done to Karl who is in such a rich vein of form at the moment. Staxton also ran at York and finished a game second to a well fancied Kevin Ryan runner. This was a very good performance from the Tim Easterby trained horse considering he had to give the winner 6 pound. The first 2 home were well clear of 3rd place and both look smart horses. Crown Vallary, a beautiful Manduro filly made her racecourse debut at Thirsk on Friday. She had an excellent performance to finish 2nd to a very well fancied John Gosden Dark Angel filly. Her owners can now look forward to plenty of good days out now, a very impressive debut. Fantastic start to the week. We have had a fantastic start to the week nothing up a couple of winners on Monday and Tuesday to break and surpass the one hundredth winner mark since we formed Ontoawinner. Cosy Club travelled to Ayr on Monday to run in the 7 furlong handicap where young Danny Sheehy took the mount aboard the So You Think gelding. Cosy is known for liking a bit of juice but always travels strongly throughout his races on any ground. Danny gave a superbly well-judged ride on the firm ground to score aboard the Adrian Keatley trained runner to land our one hundredth winner to jubilant celebrations at the Ayrshire track. Tuesday saw London Protocol make it 101 winners. The Muhtathir gelding travelled to Compiegne, France to run in the Prix De Vignemont with Tony Poccone aboard the Karl Burke trained runner. Tony kept him prominent throughout and pushed him into the lead coming into the home straight and he went onto score, landing over 14000 euro prize money for his owners in the process. Tres Bien. We do have a small number of shares available in London Protocol. He is a really nice type that has an official rating of 87 and will get his owners to big days out. 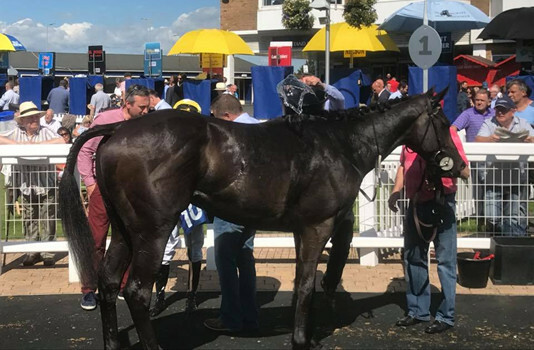 Ontoawinner, the racehorse syndicate established in 2011, celebrates their 100th winner with Cosy Club , trained by Adrian Keatley at Ayr Racecourse on 24th July 2017. Ontoawinner is a new and successful racehorse syndicate, now with 100 winners to their name in just 5 years of operation, including Dual Group 1 winner Quiet Reflection who won the Commonwealth Cup at Royal Ascot and The Haydock Sprint Cup. They also won the Group 2 Mill Reef at Newbury with Toocoolforschool. Founded by Niall O’Brien and Simon Bridge, Ontoawinner has gone from strength to strength. Ontoawinner now has 60 horses with 15 trainers in the UK, and have horses trained in Ireland and France. The ambition shows no sign of fading, and the squad of horses increases annually with a mix of tough Saturday performers like London Protocol and Flying Pursuit and exciting youngsters like Staxton and Raydiance. 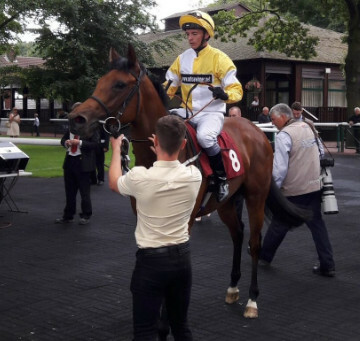 Staxton, a cracking looking Equiano colt trained by Tim Easterby made his racecourse debut yesterday when he lined up in the Pilkington Glass Novice stakes at Haydock. David Allan was aboard the 50/1 shot who was drawn in stall 10 for the 12 runner event. On paper, this looked a very difficult start to his career with previous winners and very expensive purchases in the line up. In the early stages of the race, David settled Staxton towards the rear of the field. He looked to be travelling very well and started to navigate his way up through the pack and at the 2 marker David asked him to go on and he responded, immediately gaining ground. At the furlong pole, he asked him for one final push, Staxton ate up ground on the leader to get his nose in front at the line. This was a very taking debut from the colt and he should improve from the racecourse experience. Well done to Tim and all his staff and a big well done to his owners who will be delighted with the colt winning a plus 10 race on debut!